For me, the tracking shot has always been my favorite camera movement. In our current film culture, which values incessant quick cuts, there is something to be said about being able to keep the camera running for an extended period of time. It is a testament to this that tracking shots are usually the ones people remember, and the one type of shot people are always making lists about. This single shot is equal parts thrilling and entertaining to watch. For those of you who haven’t seen “Goodfellas” yet (and if you haven’t turn off your computer and go watch it right now), it is the true story of Henry Hill (Ray Liotta), an Irish-Italian hoodlum who finds great success as a small time mobster in the 50s and 60s, but then loses it all after a string of misjudgments and bad decisions. The movie is split up into two acts: the first act is a glorification of a life of crime and taking the easy way out, and the second half is a condemnation of this exact lifestyle. 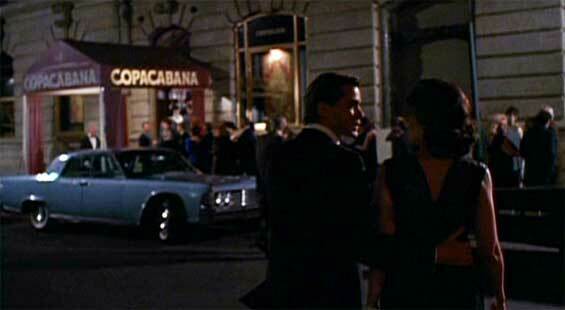 This shot takes place during the movie’s first act, in which Henry takes Karen (Lorraine Bracco) on their first date together at the Copacabana. It goes on for around three minutes, an impressive amount of time to go on without a single cut. The lingering camera gives off the vibe that an invisible third party is following Henry around and documenting his life. 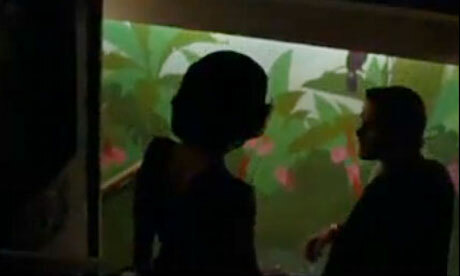 This third party may know the strife that lies ahead but for know, focuses on the glamour. The shot starts off on the street, where Henry refuses to leave his car in a garage, because he so loathes the idea of having to wait for it. As the camera continues to follow Henry and Karen across the street, they cut through the long line waiting to get in and go approach an underground entrance. Once the doors swing open and they enter, Karen has officially entered the criminal underworld. And this is a hard place to ever come back from. If this scene represents a descent into hell, a selling of the soul, then Henry and Karen are like the honorary king and queen. This scene represents what will be the apex of Henry’s mob career. At the Copacabana, he doesn’t have to wait for a table: the Copacabana brings the table to him. Once the tracking shot ends and Henry and Karen have entered the restaurant, the camera doesn’t stop there. Perhaps Scorsese felt that cutting this shot would have ruined this scene, which feels like a big encapsulation of a major moment. Most people’s greatest moment of success might be when they make a fortune or get to run their organization. For Henry, that greatest moment is when he gets to avoid waiting in line. It’s all part of Henry’s plan to be as far from an ordinary schmuck as possible. What fascinates me most about this is not just what happens onscreen, but what must have happened behind the scenes as well. It is hard to even imagine how difficult this must have been for Scorsese, cinematographer Michael Ballhaus, and all of the actors and extras in the scene to shoot and coordinate. It feels like every last action had to be so carefully plotted out and that one false move could have ruined everything. Every movement of every chef and every waiter must have been coordinated to a T. However, there are still some tiny moments that make me believe that it went off the script a few times. When Henry bumps into a plate, his reaction seems too genuine to have ever been planned. In that lies the beauty of “Goodfellas,” the reason that I (and most other viewers) watch the movie again and again: it is so obsessively crafted, yet so loose and free. We are not meant to simply watch the lives of these gangsters and their families, but become a part of it. It invites us into their lives in a way that even “The Godfather” couldn’t do. The viewer is probably smart enough to know the dangers of entering the mob. However, for this one moment, getting into the Copacabana with a front row seat of the show seems pretty damn well worth the risk. Watch the scene, with some interesting commentary from cast and crew here. This entry was posted in Gangsters, Goodfellas, Martin Scorsese, Michael Ballhaus, Ray Liotta, That One Scene, That One Shot on September 8, 2011 by ian0592. As if the Academy Awards hadn’t already lost enough of my respect by passing over both “Inglourious Basterds” and “The Social Network” for Best Picture, AMPAS has officially chosen Eddie Murphy as their host this year. This is not to say Eddie Murphy isn’t funny. After all, he did make it acceptable for a black man to play an old Jewish man in “Coming to America.” However, his comedy choices over the past decade or so have been incredibly questionable. I could bring up “Norbit,” but that’s too easy. 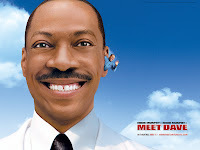 Instead, I will remind you all of “Meet Dave,” a movie in which Eddie Murphy plays Eddie Murphy inside of a space ship that is also Eddie Murphy. That sounds less like a real movie and more like something Tracy Jordan would have starred in. Hopefully, Eddie Murphy could use this opportunity as a big comeback. Or Academy members will use this as a future opportunity to actually find a comedian people still like. Stephen Colbert? Jimmy Fallon? Donald Glover? Any of these would have been good choices. *Editor’s Note: Anne Hathaway is still the most beautiful woman ever to walk the face of this Earth. This entry was posted in Academy Awards, Anne Hathaway, Coming to America, Eddie Murphy, Oscars, They've Made a Huge Mistake on September 6, 2011 by ian0592. During the first episode of “Breaking Bad,” Walter White tells his class of less-than-eager students that chemistry is not the study of chemicals, but rather the study of change. If chemistry is the study of change, then Walter is a study of how quickly a person can change. And his descent is more alarming than any chemical reaction you’ll ever experiment with. “Breaking Bad” has been labeled the best drama on television by most people who have ever watched it. It lives up to that honor. Its distinctive style leaves an unforgettable mark. Walter White, played with a ferociously calm zeal by Bryan Cranston, is a high school chemistry teacher in Albuquerque. As the show begins, life isn’t too great for Walt. He works a job well below his level of brilliance, and can barely support his pregnant wife Skyler (Anna Gunn) and his crippled son Walter Jr. (RJ Mitte). Walt is diagnosed with terminal lung cancer. Realizing he may not be around much longer, he decides to find a way to leave money for his family. In an act of desperation, he teams up with Jesse (Aaron Paul), a junkie former student of his a heart of gold, in order to cook meth. Using his extensive knowledge of chemistry, Walt cooks up the best meth anyone north or south of the border has ever seen. He becomes rich, but he also enters a world far more dangerous than he ever could have imagined. As I’ve said before, AMC has the potential to be the best network on television, if not for all of the f***ing bleeps. 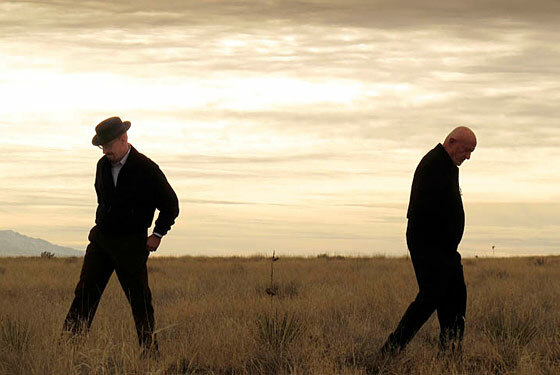 “Breaking Bad” achieves a cinematic level of storytelling. As the show unfolds, it feels more and more like everything was planned right from the start. “Breaking Bad” seamlessly blurs the line between good and evil. The show’s title comes from a southern colloquialism describing a straight-edged person who has taken a turn for the worse. “Breaking Bad” might be a show about dangerous criminals and drug deals but it will always boil down to the devastating downward spiral of Walter and how his decisions lead to the deterioration of his relationship with his family, the only thing in the world he cares about. As Walter, Cranston gives the best dramatic performance on television. He can convey a feeling simply by giving you a long, frightening glare. He makes Walter’s moral descent totally believable. 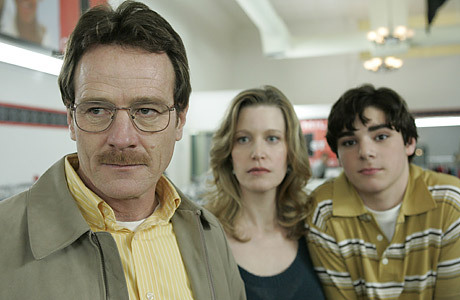 In one episode, Walter’s family tries to give him an intervention. It is a prime example of both Cranston’s work and the show’s powerhouse writing. In addition, Paul surprises as Walt’s partner-in-crime. Sometimes, he seems dumb and emotionally empty. But then he does something like save a child from his meth addicted parents. In a show filled with morally hazy actions, this was one of the few things someone on “Breaking Bad” does that can actually be described as heroic. “Breaking Bad” is a modern western in the spirit of “No Country for Old Men,” in which the characters inhabit the cowboy morale in a present day setting. It also seamlessly mixes in elements of a thriller, with many episodes echoing the atmospheric horror of “The Shining.” In short, creator Vince Gilligan is an auteur of television. This entry was posted in Aaron Paul, AMC, Breaking Bad, Bryan Cranston, TV Review, Vince Gilligan on September 3, 2011 by ian0592.